Aloha Readers! I have another blast from the past for you this evening. 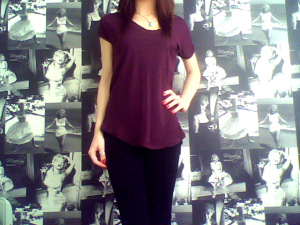 Here I am wearing a slouchy t-shirt I bought last year whilst working in House of Fraser. It is made from cashmere & is so soft against my skin. I teamed my t-shirt with my favourite boots ever – Miffin Biker Boots from Topshop. 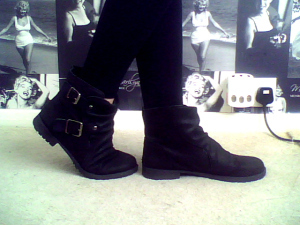 I loved these boots so much when I bought them that I went back the next day to buy another pair….just in case! Another busy day at work for me today & I will be working tomorrow. Thankfully I am off on Thursday so I am really looking forward to that. I hope to make it a productive day!